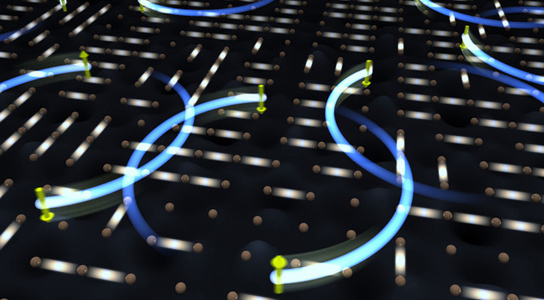 Quantum physicists have constructed an elementary network for storing and exchanging quantum information. 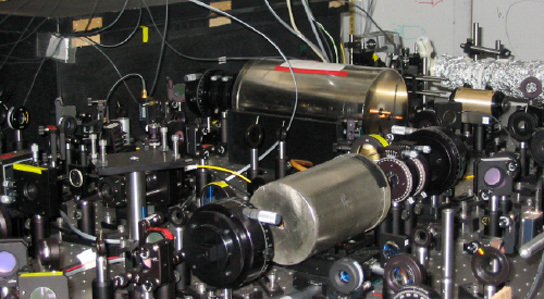 The network was setup with two all-purpose nodes, which can send, receive and store quantum information. The nodes were linked by fiber-optic cable, which carries the quantum information from node to node with a single photon. The prototype network could form the basis of communication channels for relaying quantum information, if it could be refined and scaled up. The findings were published by a group from the Max Planck Institute of Quantum Optics (MPQ) in Garching, Germany in the April 12th issue of the journal Nature. Quantum bits can use quantum superposition to store a third state, which hovers between 0 and 1, unlike classical bits that can store only two values (0 and 1). Physicists have tried to use all sorts of quantum objects to store qubits, from electrons, atomic nuclei, to photons and more. In the new experiment, the qubit at each node is stored in the internal quantum state of a single rubidium atom trapped in a reflective optical cavity. The atom transmits its stored information via an optic fiber by emitting a single photon, whose polarization state carries the mark of the atom’s quantum state. The atom can absorb a photon that came through the fiber, imprinting the quantum state of that photon’s polarization. The network could be scaled by adding extra nodes. The nodes would remain universal. It’s only recently that all of the technologies involved in this process have become sufficiently advanced for them to work together. Such networks were proposed 15 years ago, but getting the photons and atoms to communicate was difficult. The optical cavity uses mirrors to reflect a photon past the rubidium atom tens of thousands of time, boosting the changes of an interaction happening. The MPQ group put their network through a series of tests finding that they lose a significant number of photons, which limits the efficiency of the network, but they believe optical fibers could connect nodes at greater distances than 21 meters, the distance between the two connected labs. 1 Comment on "First Universal Quantum Network Prototype Operational"
I’m curious about the mirrors in the cavity and the reflection process at the quantum level. Doesn’t that involve absorption and re-emission? Does that ever change the polarization of the photon? If the photon is not absorbed and re-emitted during reflection, then how is it’s direction changed by the mirror?